Heron's fountain is a great project for a science fair, as it is simple to make and displays many of the basic principles of physics. 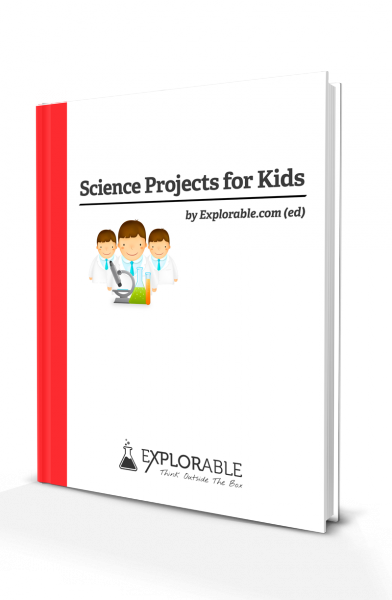 This project shows how potential energy can provide power, using water and gravity, and air and compression. These are fundamental aspects of pneumatics and hydraulics and Heron's fountain also lets you have a bit of fun during the process. The great Greek inventor, Heron of Alexandria (sometimes called Hero) created this device as one of his wonderful ways of showing students how the underlying physical and mathematical principles worked. Historians are almost certain that Heron (c. 10 CE - c. 70 CE) taught at the great university of Alexandria, Egypt, and used many of his inventions as teaching aids. You now have the chance to follow his example, by using this apparatus to show your classmates physics in action. Heron's fountain was probably cast from bronze, at great expense, but we are going to make one from much simpler materials, easily found around the home or in a local hardware store. A good explanation of how the Heron’s Fountain works. 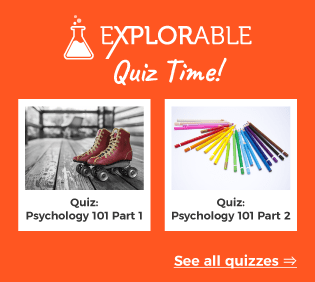 If you feel adventurous, you could try something like this for your science fair project! The Pakistan Science Club shows how to make a Heron fountain. You can do this, too! If you can get hold of glass flasks and rubber tubing, this is a great version of Heron’s fountain. 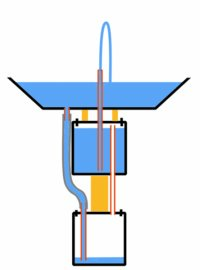 The water in the basin contains gravitational potential energy and, as it falls downwards, it uses the pneumatic pressure of the air in the air supply container to push the water in the upper, fountain supply container. Once the water drops below the level of the outlet tube in the fountain supply, the Heron fountain will stop. This experiment has lots of variations and many different ways of building depending upon time and resources. If you make one, why not film it and upload it to YouTube - you never know; we might just decide to feature it here! Your basin will need to be raised, as it must be higher than the two bottles. You may have something that you can modify, or you can make one from Meccano as shown in the video. Make a hole in the bottom of the basin, just big enough for the tubing to fit through. Push a 24" - 36" length of tubing through and seal with the silicone. Make two holes in the lid of one of the plastic containers. This will become the air supply container and must be the lowest part of the apparatus. Push the tubing through one of these - it must reach almost to the bottom. Insert another piece of tubing through the other hole - you only need to push about an inch of tubing through the hole. Make sure that the seal around the tube is airtight, using the silicone sealant. Take the plastic tubing coming from the first container and push it through one of the holes. This only needs to be pushed in about an inch. Use the silicone to fill the gaps around the tubing. This third length of tubing needs to run back to the fountain, as in the video - you can try to build a waterwheel, if you want! 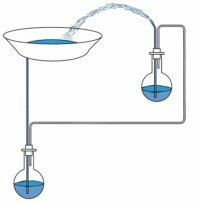 Slowly fill the basin with water and watch as water flows from the basin into the air supply container, through gravity. This will displace the water in the second container and cause it to shoot out of the tubing back into the fountain, higher than the original basin. If you want, you can insert the tubing running from the fountain supply container back into the basin through a second hole, making sure that it protrudes above the water level, to create a proper fountain. At first glance, this appears to be a perpetual motion device; a machine that can keep running forever. However, this is not the case and, as the air supply flask fills with water, the jet of water from the nozzle will decrease in power and stop altogether. To restart the machine, you will need to empty this container and refill the fountain supply container with water.